This race was fantastic. 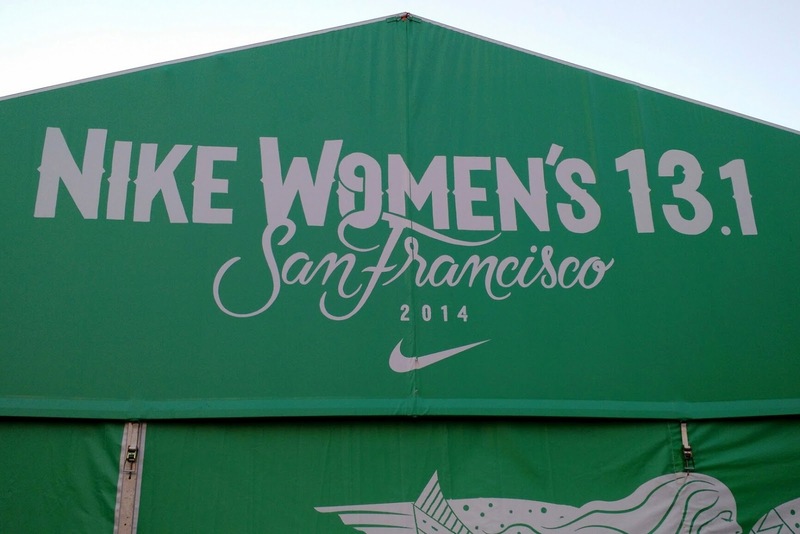 I love running in SF, I felt good running at marathon goal pace, the weather was cool, and I was strong on the hills. This was a really good tune-up for my confidence going into NYC in only two short weeks! My opinion on the NWM event has changed a lot over the past few years. When I ran it in 2011, I found it to be a logistical mess and was highly disappointed in the whole thing. I vowed never to run it again. (But of course, I did because it's local and they give out Tiffany bling!) In 2012, I had a great time but still found many things to be annoying. The third time must be a charm; this year I found it to be much more organized, not as crowded as I remember, and overall a fantastic event. It's worth noting that the race made two major changes this year. They did away with the marathon and made this a half marathon only, and in doing so they completely changed the route. From my perspective, these were both huge plusses. The focus on one event seemed to improve the logistics overall, and the new course was great. I loved it because it's different than other races in the city, and variety is fun. Finishing at Marina Green was much easier than finishing at Ocean Beach because we could walk back to Union Square. It's much harder to get back from Ocean Beach. 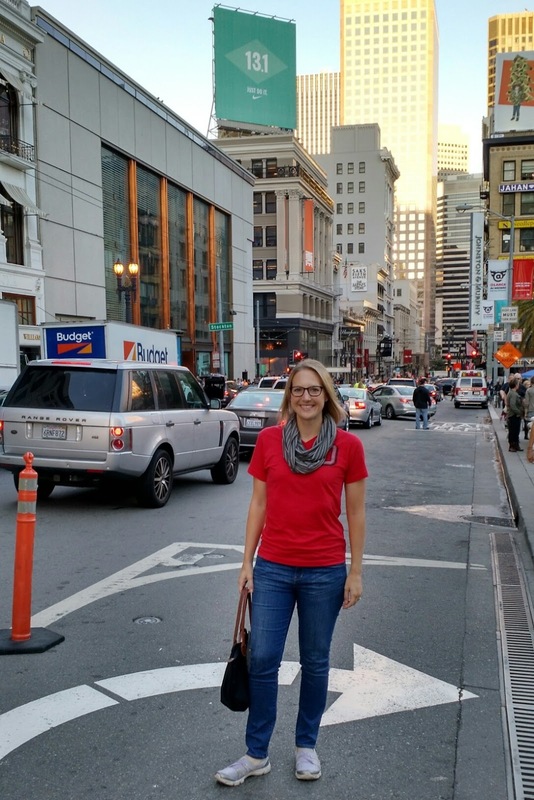 We stayed in the city on Saturday night partly to make it easier in the morning for the 6:30 am start and partly because we love an excuse to stay in SF. The race starts in Union Square, and different start corrals enter from different streets. I was in the 9:00-9:59 start corral which entered from Grant Street, and I had no trouble finding it. Each corral has its own porta potties and gear check, and they make sure you go to the right corral by checking wrist bands. The porta potty lines were huge (not shocking with so many women) but I'm not sure they could have fit more of them. I was able to move around in the corral much more than in past years. Start line, as taken by my friend Ann who was spectating. Big banner by Macy's, also from Ann. We started running and I felt good right away. My body was cooperating, my sore foot warmed up and didn't bother me, and the weather was fairly cool. We ran on some streets that no other course uses, which was fun. There were gradual uphills and downhills almost the whole time, but I love a rolling course. We ran by Alamo Square and eventually into Golden Gate Park to make a big loop of the park. Running in the park was foggy and gorgeous. I was happy to have run a couple of the longer gradual climbs during my 17 mile training run because I had a reference point of when it had felt much harder. We exited the park, headed through the Presidio, and then descended to the bottom of the big Lincoln Boulevard climb I'd been waiting for. Running up Lincoln Boulevard is hard, that's all there is to it. It's long, some is steep, and it takes effort. I felt good and I was thrilled with my stamina on the hill, plus there were tons of people cheering there to keep us going. I've also run this hill during recent long training runs, which of course helped a ton. Unfortunately, we didn't get the Golden Gate Bridge and bay views at the top because it was very foggy. Finishing the climb and immediately starting the downhill portion gave us a nice recovery period. We took the steeper route down to water level and followed the road back to Marina Green for the finish. After running up and down so much, the flat felt like it took a lot of effort. Before I knew it, I was at the finish chute to find Ann and Kevin cheering for me. A quick turn of the corner and I passed under the pink finish arch feeling awesome at 2:09:06. Perfect marathon pace training run. Ann's photo of me in the chute. The finish area on Marina Green felt larger than the one at Ocean Beach and was nicely done. We walked through the area to get food, water, and of course the coveted Tiffany necklace. However, the necklaces were NOT handed out by Firefighters, they were handed out by volunteers. I kind of missed the Firefighters in tuxes with the silver platters...but what can you do. I have a feeling this was a much better way to regulate people and how many necklaces they tried to take. There were still firefighters nearby for photo ops if you wanted to wait in line. I found Kevin and Ann, and then met up with two Oiselle flock ladies for a few minutes. They had a family meet up area with letters and it was easy to find everyone there. 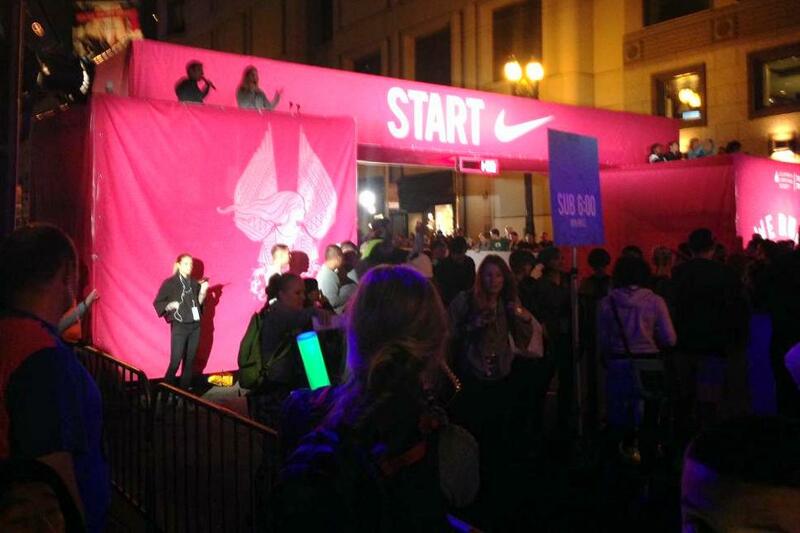 The finish area also included a Nike shopping boutique, massage, booths, and probably things I didn't see; I didn't check out any of those. Ann, Kevin and I headed straight to brunch at The Square in North Beach where I enjoyed beer and eggs benedict made with crumpets. So good. It was there that I finally opened my necklace, and I love it! Easily my favorite one of the three I have. Celebratory brunch and drinks with Ann! The Expo. The expo is held at Union Square in a big tent. I picked up my packet at the Nike store in Palo Alto the week before; it's much less crowded and I hadn't found the expo to have much to see in the past. Bib pick-up at the store was easy and quick. We walked through the expo on Saturday afternoon when we were showing Ann around a bit, and I found it to be the same as before. They don't have shops and booths like other expos; they have places to do hair, fit Nike shoes, and try Nuun. Rumor has it bib pick up for this event can take hours on Saturday, but I have never gone then to know firsthand. Posing with the big 13.1 banner. The Swag. The race is expensive, but they truly gave us good swag. 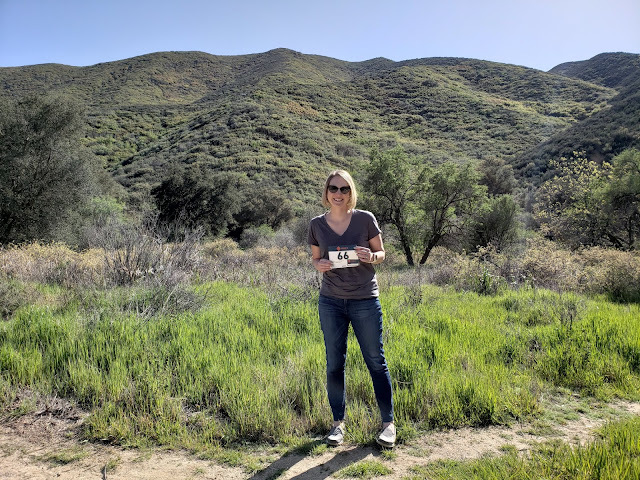 We received black tank tops as the race shirt, plastic refillable water bottles at the finish, reusable shopping bags filled with snacks at the finish, and of course the Tiffany necklaces. The course. I loved the course. It was unique and there were fun surprises along the way such as a gospel choir, marching bands, the We Run SF statue, and banners. There were a couple of spots with cameras to wave to and another spot with screens that showed our names as we passed by. They handed out chocolate around mile 12 and Clif shot blocks around mile 8. I'm pretty sure they had Nuun on the course, but I only found water when I went through the aid stations. There were aid stations and porta potties about every two miles. At one point I remember thinking there were so many porta potties along the course that I couldn't believe it, and I'd definitely never seen that many at other races. I suppose they are trying to keep 25K women happy? Improvements to note. I mentioned being annoyed in past years, so I want to outline the big changes that have made this race better for me. First, start corrals. In 2011 they didn't have the wristband and enforced corrals, and I ended up starting behind people who intended to walk the whole thing. Getting through the first mile was difficult and people were tripping over one another. This improved with the addition of enforced start corrals in 2012, but it still felt incredibly tight. This year, I think the additional separation of start corral times helped. I didn't have issues getting around people and it flowed well from the start. Second, crowding. In the past, I found myself dodging groups of people walking or slowly running three to four wide, which was terrible. That also improved in 2012, but this year I didn't find it to be bad at all. Naturally there are many people and you do some dodging, but it wasn't worse than any other large race. I have no idea what fixed this, but I'm glad it's better. It could be as simple as people starting in the right pace groups. Third, in past years I saw many people drop throw away clothes in places that were tripping hazards (like the middle of the road.) This year they had many, many labeled clothing drop bins spaced out along the first few miles and people used them. Fourth, water stations. I remember water stations being very crowded and not keeping up with the flow of runners. This time around, they were longer and on both sides of the street. It was easy to grab water and go without waiting on it to be poured. 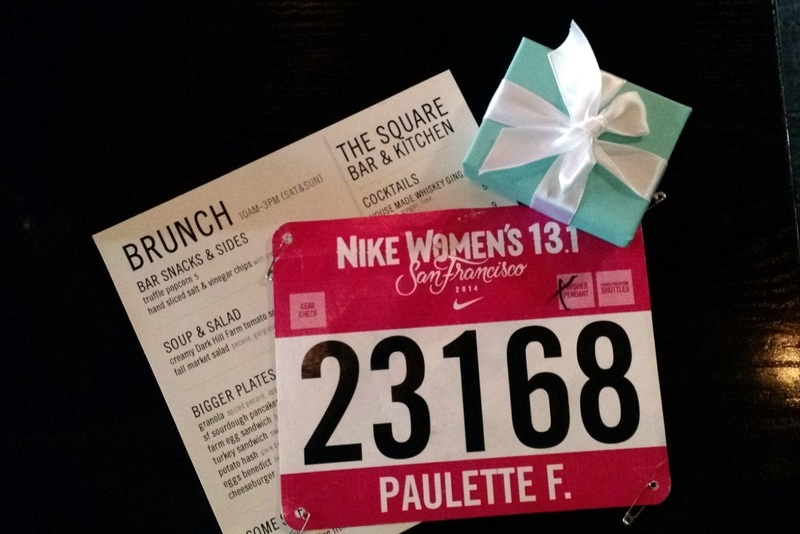 All in all, a fun race and great weekend in the city. I wish this one weren't so hard to get into! Congrats! This is on my bucket list and I love the necklace! Congrats!! OMG I love that necklace and tank top. 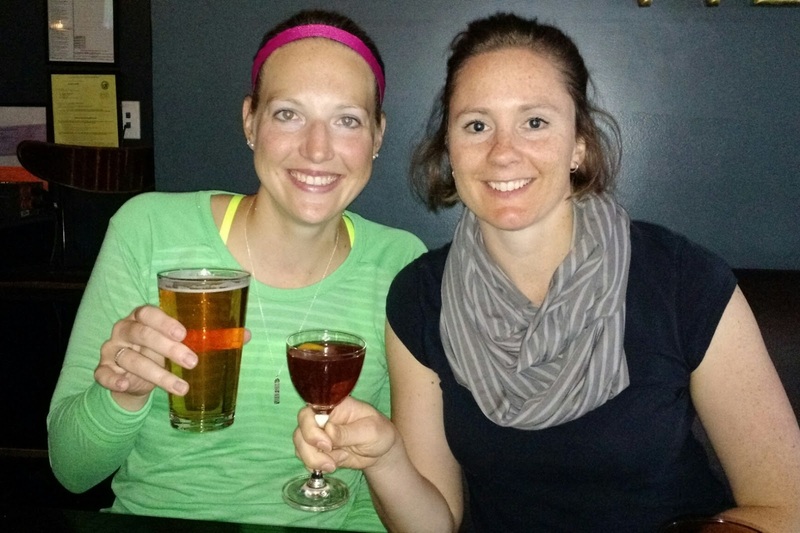 I was talking to my friend Molly before the Detroit Marathon that summer races should start doing tanks instead of t-shirts. Thanks! I love the tank idea, I find I wear tanks and LS but hardly ever short sleeves! 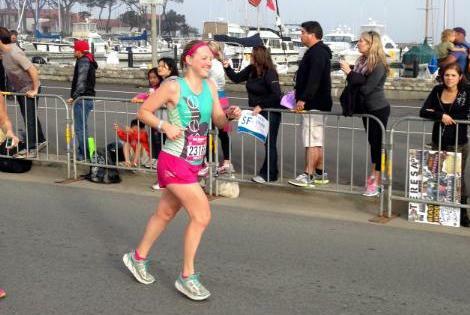 Congrats on your marathon this weekend too! I LOVE the tank and the design on the necklace. 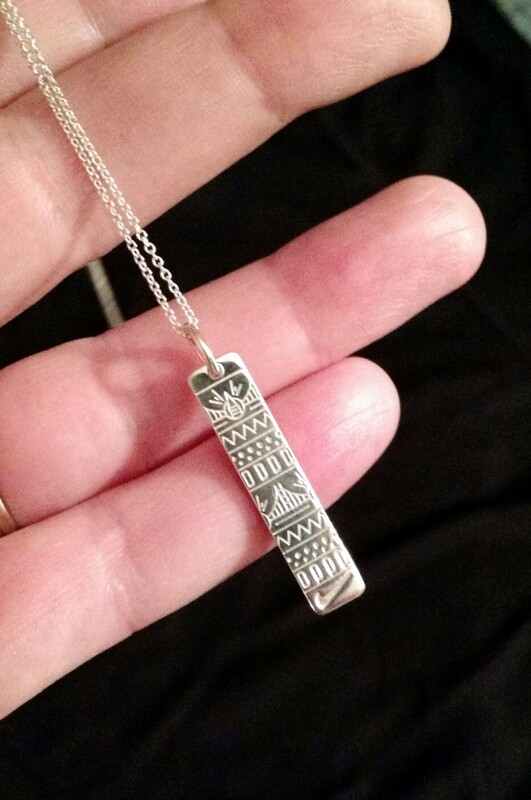 Of the Nike necklaces I have the "bar" style is my favorite. Congrats on a great race. OMG, they gave out tanks?! I've been asking every race for years to do this! Brilliant! And, wow, it sounds like such an improvement on this race. I ran it in 2008. 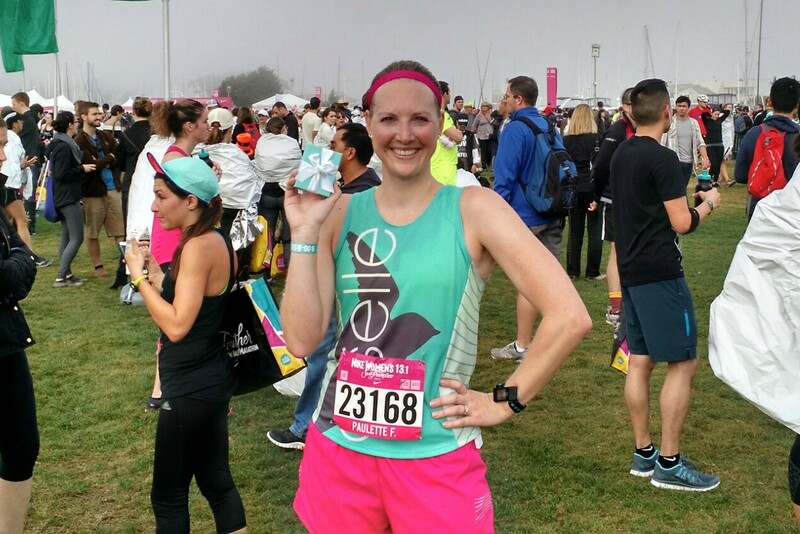 It was only my second ever half, and I was excited and thrilled and PR'ed -- and yet, I hated the terrible expo and the crowded course and the women who literally blocked me from getting to the right corral because they thought I was cutting in line. 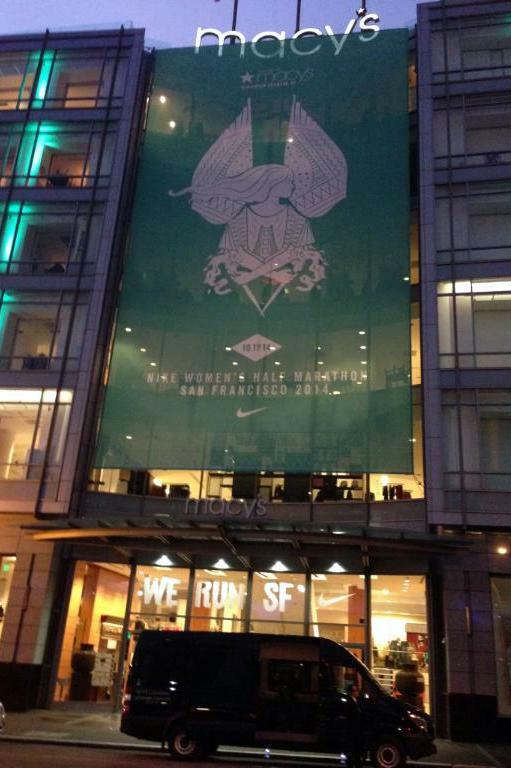 Despite the PR and being with friends and the great necklace, it forever soured me on the Nike Women's event. You actually made me think it sounds like fun now. Also, congratulations!! I'm glad your foot is ok! Thanks! I thought the changes were great this year - although I just heard others thought it was terrible. Highly confusing to me, but I guess people have different thoughts. I think they made it more like a normal race, and that's why I loved it! I should also say - I had to go in knowing it would be a nutty race, and definitely not a PR/goal type race. I found this year to be so much better though! I think the 2 of us might be the only ones pleased with this years race! I ran it in 2011 and 2013 and each year, vowed to never do it again. I loved the course change and thought the overall logistics and organization were much better this year! I've been reading recaps and posts/comments on facebook and they're all so negative, saying how horrible it was this year! Really? I'm so surprised! I found this year to be the only one I actually loved. I'll have to go check those out. I would LOVE to do this race! A friend and her daughter did it a couple of years ago with Team In Training and they had a blast; they did the full so, obviously, that is no longer an option. I like that they cut it down to one race, too, since it seems like that has had a positive impact on the organization of the event. Thanks for all of the information, Paulette; maybe one of these days...You did great! Congratulations! Glad the changes in the race proved positive for you! I ran the Nike half back in 2007. I really enjoyed the race, but then the next year they went to the lottery system and the times I've entered I haven't gotten in. I would love to go back and do this race again! The new course sounds fantastic and it sounds like they have made a lot of really great changes for logistics. 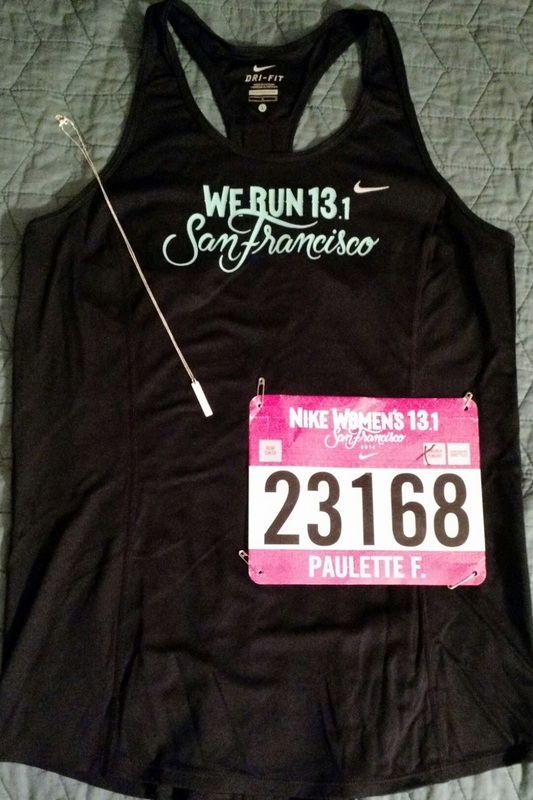 Congratulations on your race Paulette!